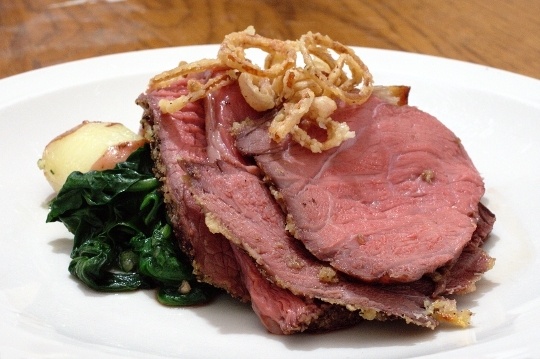 This roast beef recipe will work for most cuts of beef, it’s really a method rather than a recipe. I like using top round because it is fairly inexpensive and under utilized. When you are looking for a roast, look for cuts that will do well with dry heat methods of cooking, think rib, strip, sirloin, top round, eye round or knuckle to name a few. Pre-heat oven to 425′F. Set the roast aside and allow it to come to room temperature. Rub the roast with the garlic/shallot paste, then sprinkle generously with pepper first then salt. If you like you may sit the roast on a bed of mire poix. This adds flavor to the roast, but more importantly makes a good base for a sauce or gravy from the drippings. Throw the roast in the oven at 425′F for 15 minutes then turn the heat down to 325′F, and cook for 9 minutes per pound for rare. Remember that cooking times for these types of recipes are just guide lines. Always check the internal temperature with a food safe thermometer making sure the tip of the probe is close to the center of the roast. When the internal temperature reaches 100′F for rare or 115′F for med-rare, remove the roast and let it sit for about 15 to 20 minutes. And don’t cheat on the resting time. During this 15 to 20 minutes the jus is redistributing throughout your roast. Cut prematurely and lose the jus to the carving block. So, you’ve been very patient, carve that roast and eat! Congratulations! I look forward to reading your new book. Do you address sous-vide techniques? I have found that to be the best way to get perfect meat! nah, the techniques are pretty traditional. vadim and i do a lot of sous-vide meats/veg pretty regularly though. it give pretty fine results.